After the amazing visitor response in the last two months where more than 3500 visitors enjoyed the science, art and craft workshops, Bahrain Science Centre is hosting a series of debates starting this month. Visitors are invited to participate in debates on topics which include marine conservation, nuclear energy, genetically modified food and organic food. With the Marine theme of the month, children and youth can also come and enjoy a talk which will take them through a spectacular journey to meet weird and wonderful creatures that live in the sea. Getting visitors brains in motion with a series of exciting activities, the Centre will host debates, experiments (‘Experiment of the Week’, in which kids do their own experiments under the supervision of a science teacher), science-themed art activities, static electricity demonstrations, art workshops, MAD Science shows, animal story-telling and science talks. Visitors will be enthralled to experience the ‘Scary Skeletons’ exhibition lead by the team on a torchlight safari at the Centre. Entertaining and exciting activities are offered to develop essential life skills for visitors at the Science Centre, which falls under Bahrain’s Ministry of Social Development. “Competitive debate is a challenging and highly rewarding activity for most who become involved in it. The majority of people avoid public speaking, and debates provide a non-threatening environment to develop public speaking skills for the future. The Bahrain Science Centre encourages building these essential life skills in the youth and children”, said Assistant Undersecretary of Community Development, Mr. Khalid Ishaq, from Bahrain’s Ministry of Social Development. The debates will help to enhance public speaking skills, build friendships among teammates, and develop research and analytical skills, often a characteristic that high-level business professionals possess. It also encourages listening and note-taking skills that help students to learn faster and obtain better grades. “We are delighted with the enormous success of the Science Centre with over 3500 youths and children visiting in just two months, and we look forward to further successful events in the upcoming months at the Centre”, added Ishaq. Currently operated and managed by MTE Studios, the Bahrain Science Centre is the first of its kind in the country and all the displays are designed to be educational. 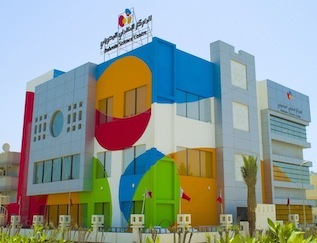 Schools in Bahrain started exploring the new Bahrain Science Centre by appointment prior to its official launch with great success since it first opened its doors in late March 2012. School groups are still being formally invited until the Bahrain Science Centre opens officially to children as well as families and adults in early October this year. The Bahrain Science Centre is located in Building 334, Road 109, Block 801, Riyadh Avenue, Isa Town, Kingdom of Bahrain and can be contacted on 343 606 31. ← My shoe fetish goes one level Up!